I was asked by a friend if I could make a cake for a wedding shower/house warming party. She had looked online and gotten a few ideas, and I told her to e-mail me what she would like. I was so happy to see which cake she had chosen! 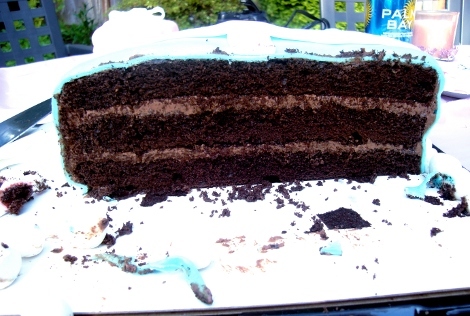 I had always wanted a Tiffany & Co little blue box cake! And as a plus, the bride to be was named Tiffany! So it was perfect. 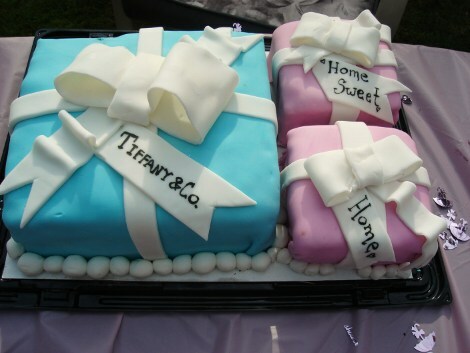 I decided to make a large blue box for the bridal shower cake, and two matching little cakes for the houswarming. The shower was pink themed as well, so I wanted to tie it in with the cake. I also made tiffany colored cupcakes to go with it, with little mini white fondant bows to match. Now, I had used fondant before to decorate cakes and cupcakes, but never for an entire cake covering! It was really easy and fun. If you have’t decorated one before with it, I would definitely try it out! Needless to say the bride to be loved the cakes! She saved one of the smaller pink boxes to bring home to her fiance! 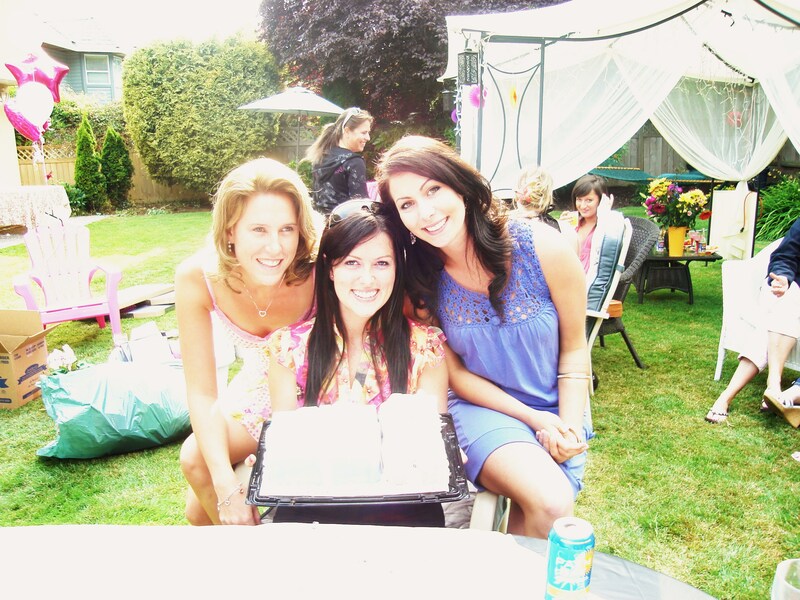 Here are some pictures of the finished cake, and a couple of the bride to be and myself! Great job! They really turned out nice! thanks ingrid! i’ve been so absent from this i’ve been way to busy! making a cake today for someone for a birthday, greek themed! we’ll see how it turns out!! Beautiful job on the cakes! Neat idea and well executed — and I KNOW they were delicious! Hi! I am the Matron of Honor for my cousin’s upcoming wedding (October 2009) and she and her fiance just purchased a new home. They are movin’ on up and my bridal shower idea has morphed into a combination “house warming/bridal shower/make their new house a home” theme. You wrote that your friend asked you to bake the (amazing) cakes – could I trouble you to share the wording on the invitations that were sent out for their celebration? hi! haha what a good idea to combine them isn’t it!? I’m not sure what they said on the invites as it was a friend of mine who has holding the shower that invited me, but i will see if i can find out!